This topic contains 9 replies, has 7 voices, and was last updated by marios 6 years ago. Sales were actually down on the January figure (35486 as opposed to 39670) but still 17.9% up on February the previous year. On an inter-annual basis that is 3 months of rises. Seems that Rocker’s observation of increased activity was correct on a national scale. Too early to call a change in the market, and it may still be a blip – we don’t know how the Cyprus effect will fall out. My wifes friends parents who have lived in spain for a long time bought and sold last month,showing that for some people it really is just a matter of paper work and figures and a matter of lifestyle and desposable income they actually upgraded their house. However, this is not a straight-forward return to growth story. The main reason for the surge in recorded sales was the end of tax-breaks for buyers at the start of this year. That brought forward sales into Nov/Dec, which then show up in the registry figures in Jan/Feb. I assume sales will then fall as there was no increase in overall demand, just a change in timing. If anything, overall demand will fall in response to higher costs. That, or house prices will have to fall even further to compensate for the end of mortgage tax relief. Lazy and unimaginative government officials in Spain and the EC are the problem. Forcing banks (that are being bailed-out) to give mortgages to people who demonstrate that they can repay, forcing banks to unload their inventories at lower prices, making a commitment to fix the overall approach to taxes (code and rates) for a 10 year period (instead of having changes every other week), and providing deep tax discounts for buying a home now are a few important steps that could really change the overall economic outlook in Spain. Acknowledge that the banks are a mess and will need subsidies for the next 30 years while ‘clearing’ them of corruption and attempt to revive other sectors of the economy, starting with real estate is a workable approach. Each sector has impact upon secondary and tertiary industries. For real estate, it is reforma, the need for gardeners, purchases of furniture, electronics, divorce lawyers :), etc. What they are doing now is at such an theoretical, abstract and macro level that it accomplishes nothing except moving Spain closer to revolution. It’s a popular misconception that it is no longer possible to get a Spanish mortgage. If you buy a bank repossession, you are likely to be offered a mortgage in excess of 100%. I would stress, however, that I personally don’t think it’s a good idea. You would be buying into a falling market. I would like nothing better than the market to stop falling, I look around for signs of it, not for myself because I’m not selling, but for all those expats still arriving with rose-tinted glasses. We’ve got two lots about to arrive, they’ll be at the estate agents not long after I pick them up from the airport, no matter what I say to them. My shortly-to-arrive visitors are about as normal as you can get, ordinary Brits looking for a holiday in the sun. I can see the envy in their faces when I take them out for a meal or sightseeing. I’m closely related tom them and show them the nice places, the secret places I normally try and keep to myself. One of them is a Spanish restaurant on cliffs by the sea. It’s a mind-blowing place, eating and drinking in the sun while watching fishing boats and yachts negotiating their way into the nearby harbour. Or I take them to a Spanish mountain village where time appears to have stood still, the friendliness and hospitality of the natives is unbelievable. 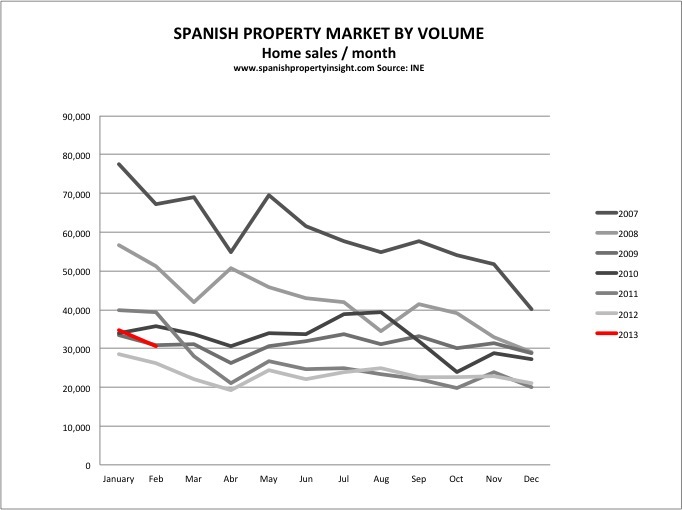 To try and put those people off from buying a home in Spain because of the financial reality is impossible. I’m brown as a berry and happy as a Samboy; I find it hard to be serious when lecturing my relatives on falling Spanish property values and homes being bulldozed. They say you can’t buy love, but I firmly believe you can buy a bit of happiness. I’m not an estate agent but I’m happy for you to believe that I am. I’m happy to admit I have a close friend who is an estate agent. You would probably know the guy because he used to operate in Marbella in a big way. Believe it or not, I’m also friends with a family of Spanish property developers, former olive farmers who hit the big time when they sold their fincas for a fortune and imported Moroccans to build thousands of houses for them. They’re on first name terms with every mayor for miles around. But walls have ears, and that’s all I’m going to say.